So this week I’m sticking with my theme of shining light on some of the more basic pieces most of us carry in our collection and am highlighting a plain camisole that I’ve had for years. These are more than basic layering pieces to stave off the cold or layer under a low neckline, they are great little stand-alone pieces. 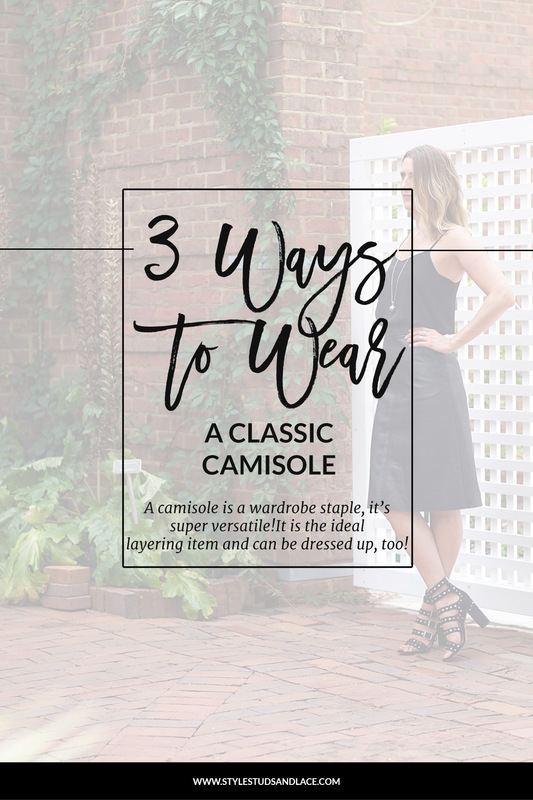 The three outfits I’ve chosen to share are just a few of the many ways I’ve been wearing this cami through the spring and summer months. It truly is a versatile piece and as such I had a hard time deciding which three outfits to share with you so you may well see this featured again! Yep, I wore this in the 90’s and am wearing it again, over 20 years later! I love to throw a Marmite look into my #threewaystowear posts and this look is definitely one of those. Which camp are you in? Do you love it, or hate it? I love it and one of the reasons is that I struggle to wear such a strappy cami over looser fitting jeans like these as the narrow straps enhance my pear shape and make me feel even more bottom heavy. However, if I layer a tee underneath the cami, it prevents the thin straps from narrowing my shoulders. Brilliant! We all know that cami’s are perfect for layering, but can be layered under so much more than chunky sweaters and v necks. I’ve been wearing mine under a sleeveless duster a lot lately (I just change the footwear) it’s one of my current go-to outfits. You’ll notice that I’ve tucked the cami into my high rise jeans – it’s such a great way to lengthen my legs a little, and who doesn’t want longer legs?! This is by far my favourite look of the three this week, it’s a combination I hadn’t worn before (discovering new outfits is one of the main reasons I love pulling together these posts!) and is the result of me sorting out my closet for the coming season. This skirt is an old favourite of mine which I normally wear with chunky knits and ankle boots, but fall is still a million miles away here in South Carolina so I thought I’d try pairing it with something lighter and loved the outcome! 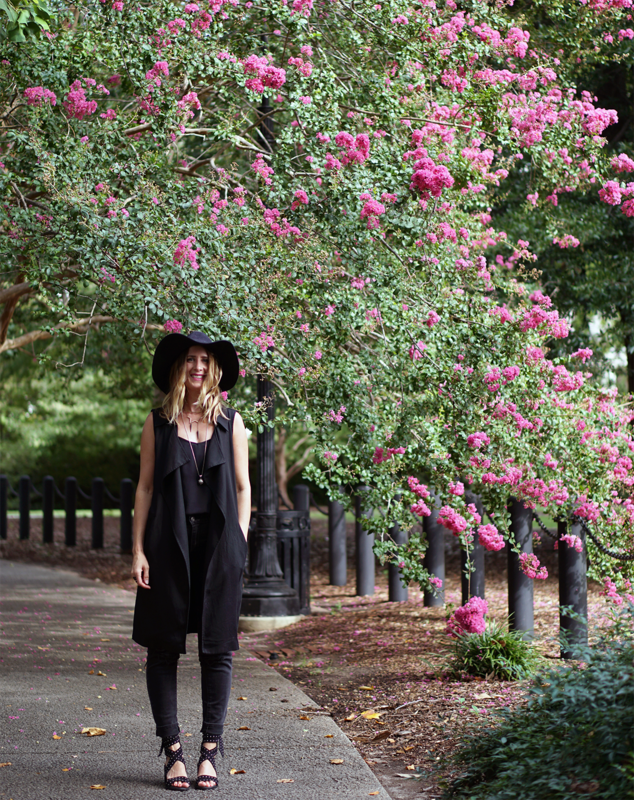 How do you transition into a new season? I know some of you struggle, and if this is you, tell me why that is in the comments below! LOOKING FOR YOUR PERFECT CAMI? If you enjoyed this post and want some more tips on styling the basics, you should check out this post here where I share three ways to wear a basic white t-shirt. 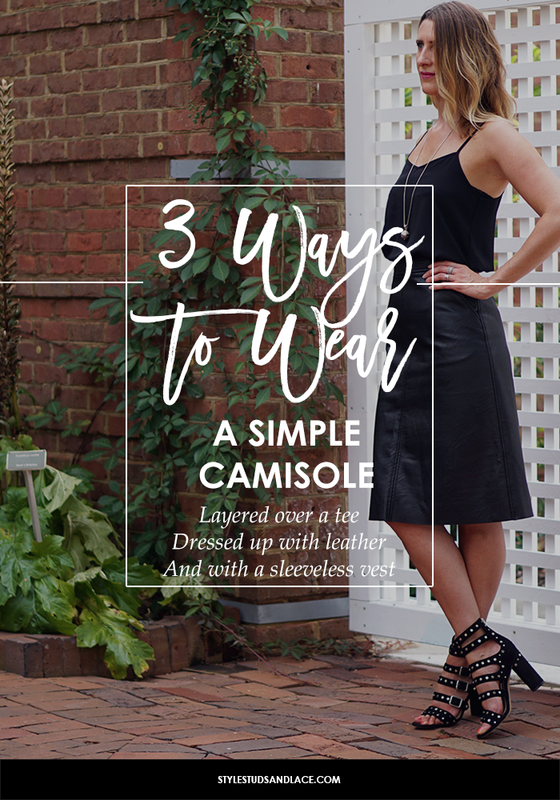 Or what about this post by guest blogger Terra illustrating three ways to wear a classic silk blouse?